When U.S. Women’s Soccer legend Abby Wambach does something remarkable, she usually does it with her feet or her head. During Wambach’s tenure in international soccer, she set the record for scoring the most goals of any man or woman in the history of the sport (184), making her trademark physical prowess a tool both widely respected and feared. During her recent address at Barnard College commencement, however, the soccer star revealed that she has another impressive talent in her toolkit: her ability to tell personal stories. The skill allowed her to deftly craft and deliver a commencement address on women’s equality that has already become one of the year’s most popular and celebrated speeches. Speakers commonly use personal stories as a means of rapport-building; if you can incorporate a personal story that listeners relate to, they’ll feel aligned with and trust you. However, in her Barnard speech, Wambach went beyond using personal stories as a means of creating common ground. She used personal anecdotes to harness the full power of a persuasive speech. Her talk engaged listeners, motivated them, inspired trust, and spurred action. Most importantly, her message was crystal clear: believe in your self-worth and promote the worth of the women around you. Abby Wambach is an American sports hero, but she’s not necessarily a household name in the same way, say, a commencement speaker like Oprah is. So, Wambach used personal stories to prove her credibility. She talked about being given ESPN’s inaugural Icon Award and co-captaining Team USA in the World Cup. She also described her experience being the subject of a Gatorade commercial (“Forget Me”), where she urged young girls to surpass her progress and “forget her”—a phrase that’s become a rally cry in the fight for women’s equality. If anyone questioned who she was or why they should trust her when she walked on the stage, they weren’t questioning it once they heard the stories about her achievements. Wambach’s experiences allowed her to subtly say: I am one of the world’s most successful and celebrated sports figures; you can trust the wisdom I have to impart. When you’re on the edge of your seat, waiting to find out what happens next during a talk, you’re undoubtedly engaged with your subject matter and craving a resolution. Wambach kept her audience guessing when she told a story about how she, Kobe Bryant, and Peyton Manning all won post-retirement ESPY Awards at the same time—but, that as they walked off the stage, she faced a starkly different, darker future than her male counterparts. Wambach made listeners wonder what kind of future she was facing, and she used this suspenseful anecdote to introduce a challenge that both she and the female grads faced upon entering the workforce: the gender pay gap. She also hinted that while things were currently unfair and challenging for women, she also had a solution for the future, keeping listeners riveted until she could reveal what it was. Graduation ceremonies are long. Graduates are tired or hungover, and parents are mostly just there to snap photos of their kid as they cross the stage. So, Wambach needed to make sure her audience stayed engaged during her talk. One of the most entertaining parts of her speech was a story about coaching her 10-year-old daughter’s soccer team. The little girls on the team didn’t know who she was, and they asked her what she did for work. When she told them she had retired, they asked her, “From what?” Wambach’s story got laughs and reengaged any extra-tired grads. Calls to Action, or CTAs, are arguably the most important part of any persuasive speech. If people leave your talk and they’re not sure what they’re supposed to do next, you didn’t actually accomplish what you set out to. Wambach made her CTA clear and unforgettable by telling about how as a teenager, she got to play a training game against her soccer idol, Michelle Akers. Akers was, at first, interested in helping teach the teens she was playing with. But when she realized that her team was down by 3 goals, she went into battle mode, screaming at the goalie “Give me the effing ball!” Then she dribbled down the field, scored and repeated that until she won. Wambach told the grads that what Akers did was exactly what they should do in life (this was their CTA): demand what they are worth and insist on having opportunities made available to them. Wambach encouraged the grads to yell “Give me the effing ball!” at people who have what they want—which not only made for a clear CTA, but also a memorable one. The most persuasive talks have specific elements that make them powerful: tension and resolution, relatability, a memorable and clear takeaway, and an engaging quality. During her Barnard commencement address, Wambach was able to check all of these boxes using one very powerful tool: personal storytelling. Wambach showed that keeping an arsenal of personal stories doesn’t just give you a bank to pull from when you want to show that audiences can relate to you. It also can be relied on as a resource containing all of the essential building blocks you need for a persuasive speech, which you can turn to again and again. 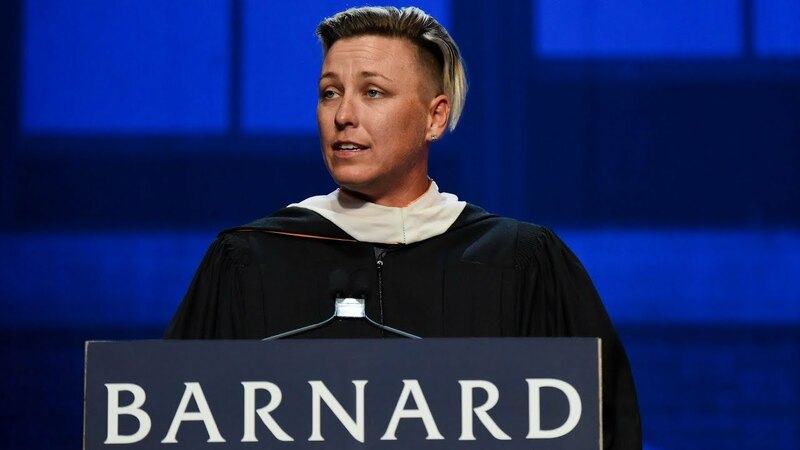 You can watch Abby Wambach’s speech on Barnard College’s YouTube Channel.